A native Texan, Scot Miller’s interest in photography began in the early 1970’s. Through his photography, he attempts to inspire an appreciation and understanding of the uniqueness of places such as Yosemite, Walden, the Maine Woods, the Texas Hill Country and the Great Trinity Forest. Eighty-nine of his photographs illustrate Walden: 150th Anniversary Illustrated Edition of the American Classic, published by Houghton Mifflin in 2004 and sixty-three of his photographs illustrate Cape Cod: Illustrated Edition of the American Classic, published in April 2008. In the Spring of 2011, Houghton Mifflin Harcourt is publishing My First Summer in the Sierra: 100th Anniversary Illustrated Edition featuring seventy of Scot’s color photographs. Scot has also been involved in a multi-year project photographing Yosemite's expansive backcountry wilderness areas with four other photographers in cooperation with The Yosemite Fund. As a result, First Light: Five Photographers Explore Yosemite’s Wilderness was published in Summer 2009. Scot is currently photographing extensively in the Maine Woods, Yosemite National Park & the Sierra Nevada and the Texas Hill Countr,y where he was recently named the first Artist-in-Park for Lyndon B. Johnson National Historical Park, located in Johnson City and Stonewall, Texas. Scot’s photography has been featured in publications and books including America’s Famous and Historic Trees, America West Magazine, Cape Cod Life, D Magazine, National Wildlife, Steinway & Sons Magazine, Yosemite Magazine, Yosemite Fund Annual Reports, the National Park Service’s Yosemite Valley Plan and other Yosemite-related projects, and the National Park Service's Special Resource Study of Walden Pond and Woods. Scot was also featured on “CBS Sunday Morning” with Charles Osgood. In addition, a selection of his large-format photographs of Italy are now being displayed in many Romano's Macaroni Grill restaurants throughout the country. For the last fifteen years, Scot has found another way to further catalogue the beautiful scenery he photographs--he carries a digital video (now high-definition) camera system into the field, which can be a challenge when backpacking into the Yosemite backcountry or standing on frozen Walden Pond. His footage has been used extensively in many Yosemite Fund videos, in a recent video for the Walden Woods Project, narrated by Walter Cronkite, in a September 2004 story on “CBS Sunday Morning” with Charles Osgood, and in many news reports. As part of Miller’s lifelong commitment to conservation, he offers his photography to the Walden Woods Project, The Yosemite Fund and Groundwork Dallas for use in any efforts to raise money for restoration or to raise awareness. 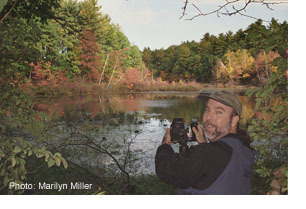 He donates a percentage of his Walden Woods photography sales to the non-profit Walden Woods Project, of his Yosemite National Park photography sales to The Yosemite Fund and of his Great Trinity Forest photography sales to Groundwork Dallas. In addition, for each copy sold of Walden: 150th Anniversary Illustrated Edition of the American Classic and Cape Cod: Illustrated Edition of the American Classic, Scot is making a donation to the Walden Woods Project. Scot and his wife, Marilyn, are also supporters of Friends of Cape Cod National Seashore, a non-profit organization of caring individuals who have a very special love and respect for the Cape Cod National Seashore and Friends of Lyndon B. Johnson National Historical Park. Miller co-owns Sun to Moon Gallery in Dallas, Texas with his wife, Marilyn. The gallery is devoted exclusively to fine art photography.